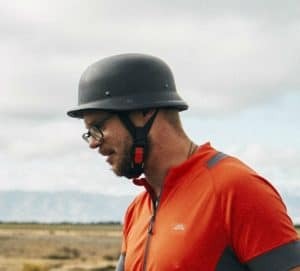 We were a motley crew assembled with an objective to ride, experience, film and photograph the Alps 2 Ocean multi-day ride from the Southern Alps to the Eastern coast. All in the short time of 5 days. We were Kiwi’s, Pommes, Aussies, Belgians, Americans…. 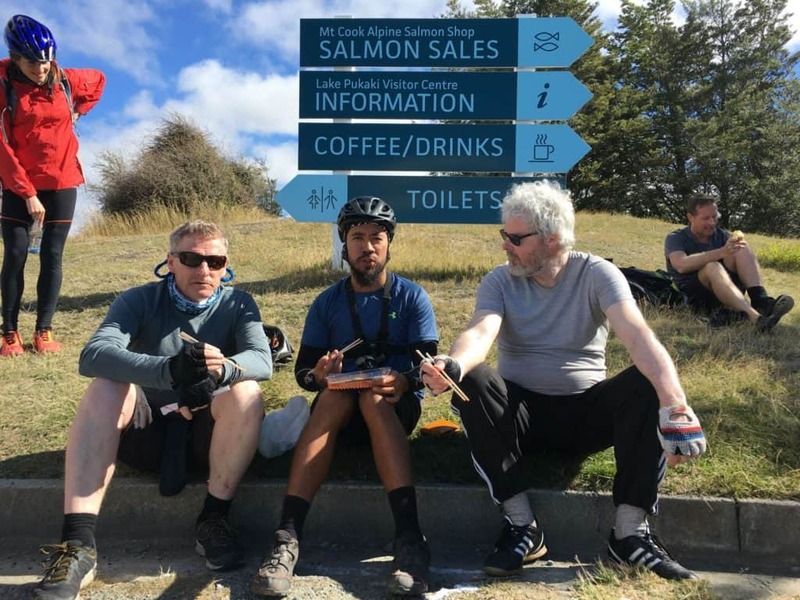 Some of us regular riders, some of us not sat on a bike for 30 years… and we were going to ride almost 300Km across New Zealand, of course it was going to be an interesting! The group: Jason from Alps2Ocean marketing team. Sara from Waitaki Tourism. Kenny Smith the photographer. Dougal Jackson the videographer. Douglas, the guys that build the App (Gratia App). Robert, the guy who was friends with the guy who built the App, Fabienne from Aussie Tours in Belgium. Andy Fabienne’s (secretly super fit on a bike) partner. 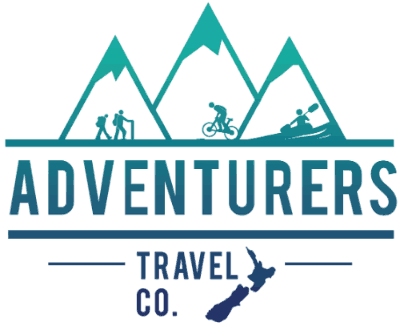 And me, mountain biker and operator of Adventurers Travel Company. Here is the first ride of 5. 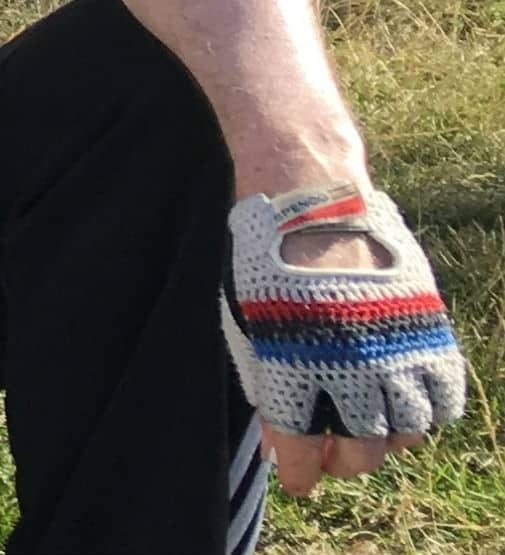 After a few dramas of realising I had no gas with me, trying to find a pump that works, finding the right tools to change Kenny’s SPDs to Crankbrothers pedals, then having the usual fight with the pedals to undo them (and much to our shame, a quick Google search to remind ourselves of which way to undo them!) …. Plus a hearty breaky at Run 76 Café…. We eventually set off! The trail out of Tekapo quickly took us out of town and to the Tekapo A power station. 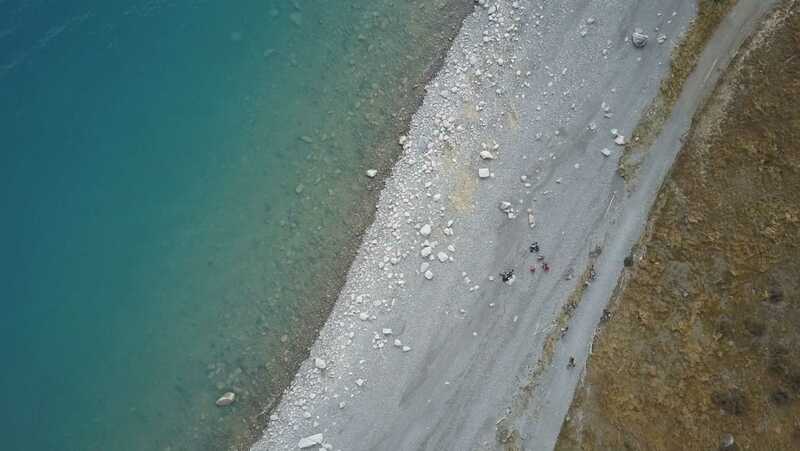 This is where the Tekapo Canal starts and we hit the sealed but not public access road that follows the canal. Anyway… The scenery was already impressive, with the long straight views down the canal, the still reflective water and the valley of the old river bed and flood plains below to the left. The group started to find a pace and we began to warm up. Kenny and Dougal gave us a taste of how things would work with numerous photo shoots along the way. Both riding hard to pass us, finding a location, setting up quickly and then shooting us riding past! My favourite was the lying in the centre of the road and us riding as close to them as possible before we had to choose which side to duck out to! 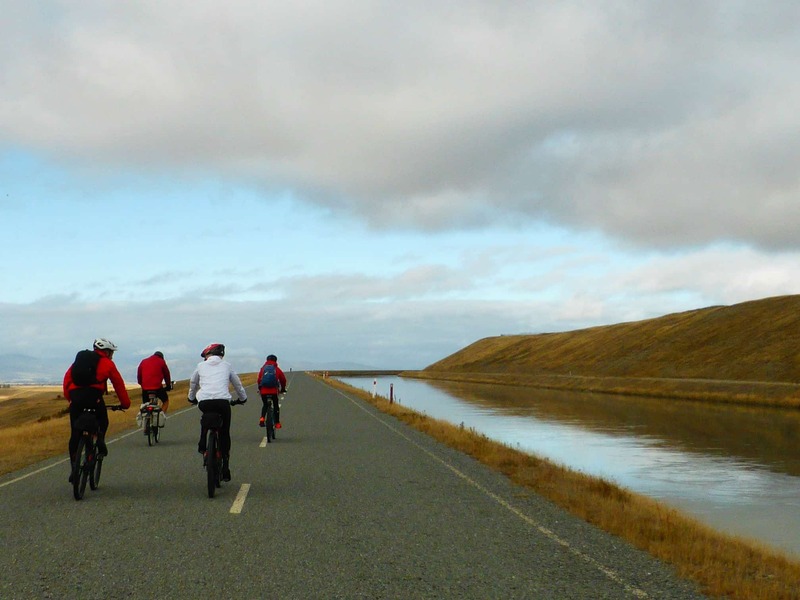 The long, flat sealed road turned to gravel at some point as we continued to follow the still canal. Mackenzie Country below us looked dramatic with the grey clouds and odd rays of sunshine. Luckily for us the wind was not blowing (like it can do here) and we had an easy start to the ride (@24Km). 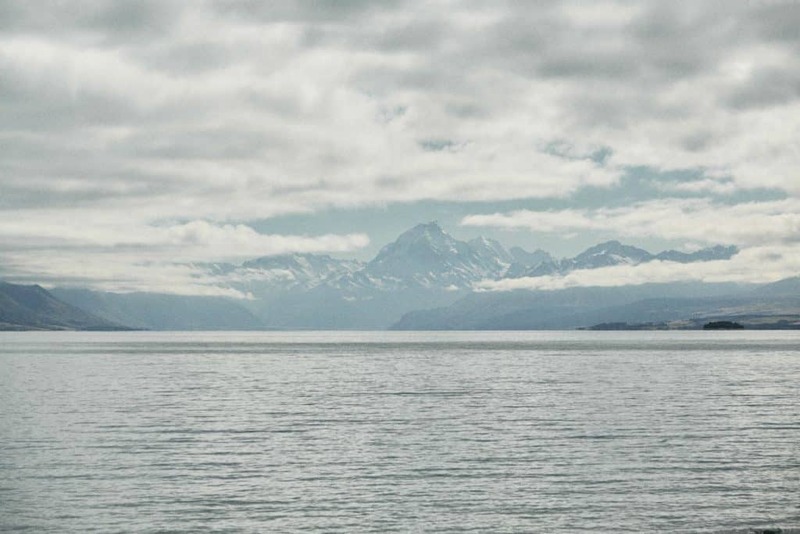 Although our first glimpse of Lake Pukaki was not the picture postcard bright turquoise one, it was still very beautiful. From the vantage point at the end of the canal it was possible to see where Mt Cook (Aoraki) should be! That is if there were no clouds! 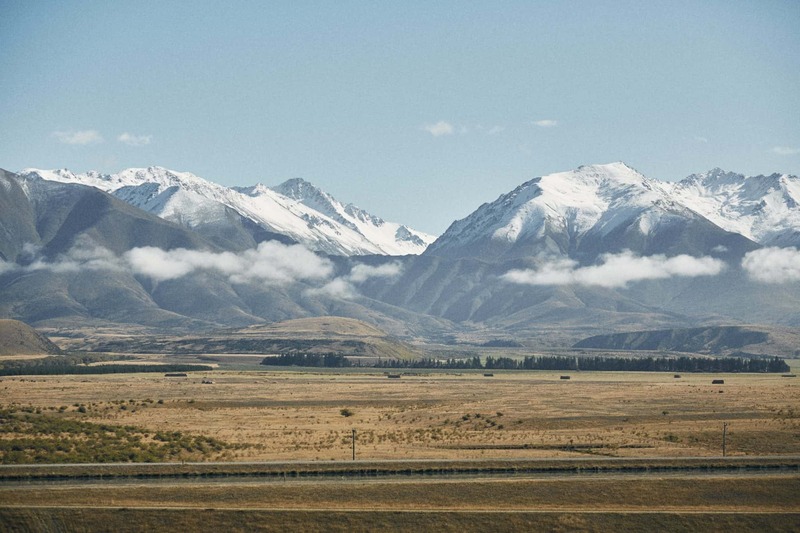 Aoraki means Cloud Piercer…… which is generally what Mt Cook does, with only a lucky 30% of people seeing the top of Mt Cook on their visits. But lucky for us, the days weather showed promise! 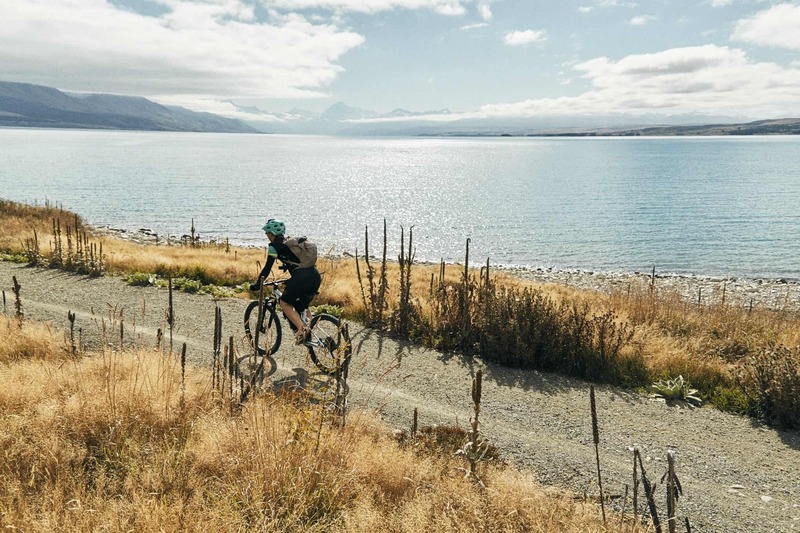 With a fast sealed downhill we reached the shores of Lake Pukaki. And in no time at all we onto a cool, wide, smooth trail running alongside the lake. @30Km. Lined by flax with some nice bends and undulations, the riding was fast along here. However, the view just kept distracting us, so it wasn’t long before we stopped for a lakeside lunch stop. Whilst we munched on our sandwiches, as if on que, the clouds cleared, the sun began to shine, the lake turned its famous turquoise and Mt Cook appeared! Obviously, it was the perfect opportunity for getting the first piece of drone footage of the group. Kenny, Dougal and I stopped so many times over this trail section for photos and footage. The view was fantastic, the riding was fast and fun and the sun was shining. It was simple gorgeous! 10Km of easy, near flat riding among the golden grass. Mackenzie country is named after one of New Zealand’s most enduring folk heros James Mackenzie. He was famed for stealing 1000 sheep and walking 160Km into what is now Mackenzie Country, before being caught be police. He then escaped from prison twice and was released after only 9 months due to serious flaws found in the police investigation. From here it was only a few more Kms to Twizel, our stop for the night. We rode on through town and straight to the pub in the centre! A well deserved local craft beer awaited at the Ministry of Works! 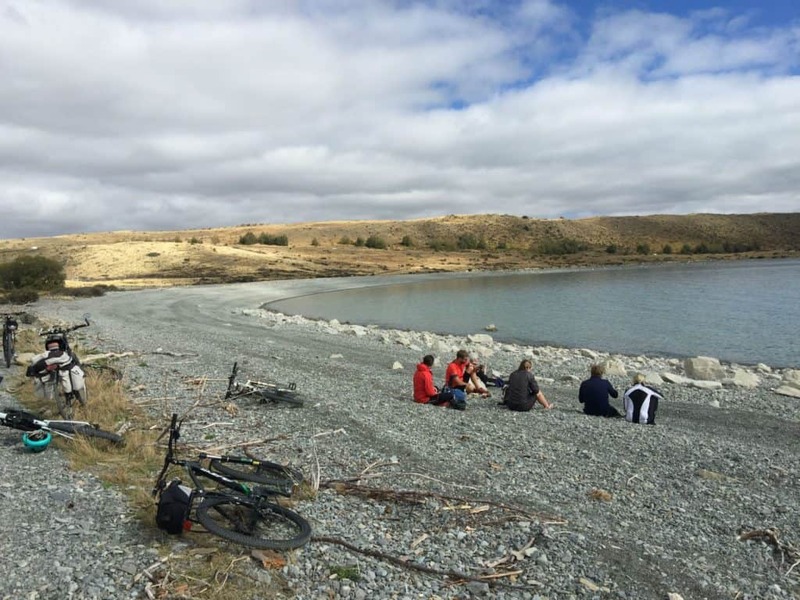 Lake Tekapo to Twizel (alt route to Mt Cook to Braemar Road) – 54Km. 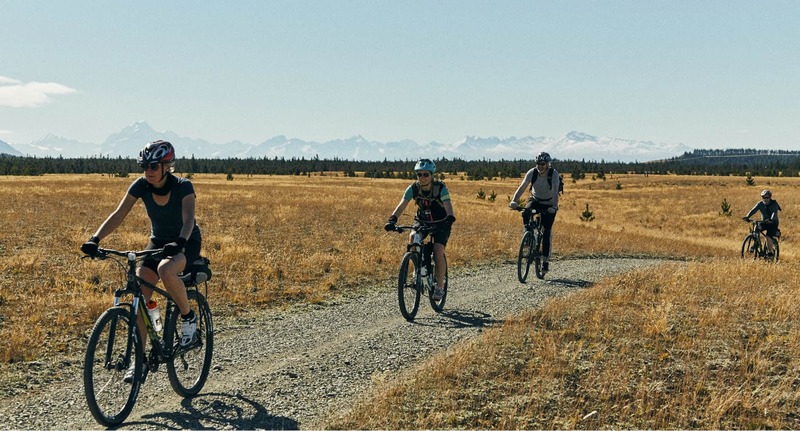 A day of impressive scenery, lakes, mountains and grasslands. Grade 2. Easy. Flat terrain. 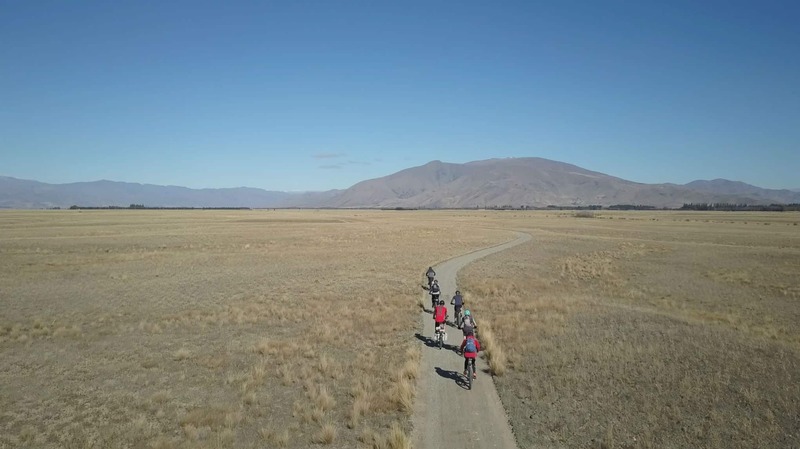 Fit riders looking for a good challenge could happily ride this section and Twizel to Lake Ohau in one day. Blogs of Days 4 and 5 to follow. Contact Adventurers Travel Company to organise your Alps to Ocean adventure for you.